​​Subject matter eligibility in the United States has recently become a key issue in patent law that has impacted a wide range of technologies in both the life sciences and technology industries. Despite the increased importance of eligibility, there remains a great deal of uncertainty and confusion surrounding the tests that have been implemented by the courts and the U.S. Patent and Trademark Office to assess eligibility. Following the U.S. Supreme Court’s Mayo and Alice decisions, the USPTO adopted a divergent eligibility analysis framework as it relates to particular forms of subject matter. In particular, one key distinction that exists within that eligibility framework is an apparent “detour route” only available to products of nature — which, not surprisingly, skews heavily to the life sciences industry and is largely irrelevant to the technology industry. This “detour route” involves initially assessing whether a composition claim is “directed to” a product of nature exception via a “markedly different” test. The “markedly different” test focuses on whether claimed subject matter is structurally or functionally different relative to a naturally occurring counterpart or set of counterparts. If the claimed subject matter is different, the USPTO does not consider the claim to be “directed to” an exception, which can conclude the eligibility inquiry in the applicant’s favor. As such, the “markedly different” test serves a de facto gating function for assessing whether a claim is “directed to” a product of nature exception. Such a gating function remains (from the USPTO’s perspective) unavailable to the other exceptions based on its current guidance memoranda even though many claims in technology-focused patent applications encompass functional differences relative to the state of the art. Instead, the inclusion of a law of nature or abstract idea exception in a claim is more often than not regarded as sufficient to consider the claim as being “directed to” the corresponding exception in the context of the eligibility framework analysis. While this divergent eligibility analysis framework largely continues to persist at the USPTO, the Federal Circuit has recently begun to find eligibility in a handful of select patent cases including DDR, Enfish, McRO, Rapid Litigation Management and Bascom, among other more recent cases. While not all of these select cases are perfectly aligned with the “markedly different” test at the USPTO, many of their holdings are based on similar reasoning that focuses on certain functional differences that exist between the claimed invention at issue in each case and the respective “state of the art.” The similarity of the reasoning offered by these recent Federal Circuit cases (in particular Bascom) with the holdings of the key Supreme Court cases underlying the “markedly different” test suggests a more consistent, and less confusing, approach to patent eligibility determination may be near. The functional difference portion of the “markedly different” test is based in large part on two key Supreme Court cases: Chakrabarty and Funk Brothers. In 1972 Ananda Chakrabarty filed a patent application on a genetically modified bacterium that was capable of degrading certain components of crude oil. He developed this bacterium by engineering a way for multiple plasmids, each of which is capable of breaking down different individual hydrocarbon components of crude oil, to be incorporated into a single bacterium. The multiple plasmids allow the engineered bacteria to break down oil from oil spills at a much quicker rate, and they are not as affected by certain environmental conditions that can exist in that context. A bacterium from the genus Pseudomonas containing therein at least two stable energy-generating plasmids, each of said plasmids providing a separate hydrocarbon degradative pathway. U.S. Pat. No. 4,259,444 at claim 1. In Diamond v. Chakrabarty, 447 U.S. 303 (1980), the Supreme Court noted that the inventor had added four plasmids to a bacterium, which enabled it to break down various components of crude oil. 447 U. S., at 305, 100 S. Ct. 2204, 65 L. Ed. 2d 144, and n. 1. Following this, the court held that the modified bacterium was patentable. It explained that the patent claim was “not to a hitherto unknown natural phenomenon, but to a non-naturally occurring manufacture or composition of matter — a product of human ingenuity ‘having a distinctive name, character [and] use.’” 447 U. S. at 309-310, 100 S. Ct. 2204, 65 L. Ed. 2d 144 (quoting Hartranft v. Wiegmann, 121 U. S. 609, 615, 7 S. Ct. 1240, 30 L. Ed. 1012 (1887); alteration in original). 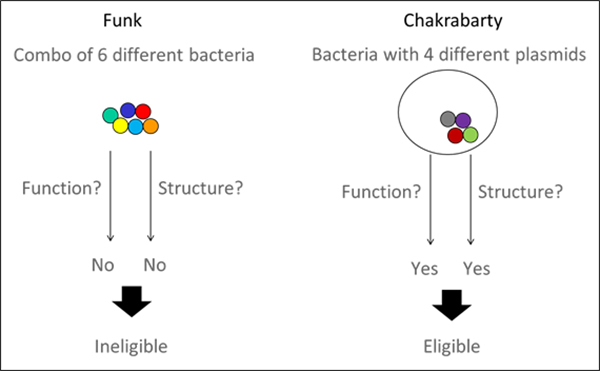 The Chakrabarty bacterium was new “with markedly different characteristics from any found in nature,” 447 U. S., at 310, 100 S. Ct. 2204, 65 L. Ed. 2d 144, due to the additional plasmids and resulting. “capacity for degrading oil.” Association for Molecular Pathology v. Myriad Genetics, Inc., 569 U.S. __, 133 S. Ct. 2107, 2116-2117 (2013). Thus, the bacterium of Chakrabarty met both prongs of the “markedly different” test, i.e., it had both a structural (a bacterium plus four internal plasmids) and functional (a new ability to degrade oil) difference relative to the naturally occurring counterpart bacterium. Funk Brothers Seed Co. v. Kalo Inoculant Co., 333 U.S. 127 (1948) is an older but increasingly important Supreme Court decision holding that an implementation of a natural principle or phenomenon of nature was ineligible for patent protection. Prior to Funk Brothers, it was known that one could apply various species of root-nodule bacteria to certain species of leguminous plants to increase their nitrogen uptake. It was also generally understood that the presence of a bacterial species that would help one type of plant could sometimes inhibit other bacterial species from helping other types of plants. Thus, to avoid these inhibitory effects, growers would oftentimes use various inoculants each containing only one bacterial species for inoculating a corresponding single plant species, but would avoid creating bacterial mixtures given the potentially deleterious effect. As a result, growers and their suppliers needed to stock multiple bacterial inoculants for different species of plants. The patentee in Funk Brothers (Kalo) discovered that there are certain species of root nodule bacteria (Rhizobium species) that do not exert a mutually inhibitory effect on one another when they are all present in a mixture together. Thus, growers could buy and sellers could stock a single mixture to inoculate a wide variety of plant species since they no longer needed a different inoculant for each species of plant. As such, Kalo was able to provide a functioning mixture of bacteria capable of inoculating various species of leguminous plants. An inoculant for leguminous plants comprising a-plurality of selected cultures of different species of bacteria of the genus Rhizobium, one of said cultures being Rhizobium trifolii alpha, said cultures being substantially unaffected by each other in respect to their ability to fix nitrogen in the leguminous plant for which they are specific. U.S. Pat. No. 2,200,532 at claim 1. Discovery of the fact that certain strains of each species of these bacteria can be mixed without harmful effect to the properties of either is a discovery of their qualities of non-inhibition. It is no more than the discovery of some of the handiwork of nature and hence is not patentable. The aggregation of select strains of the several species into one product is an application of that newly-discovered natural principle. But however ingenious the discovery of that natural principle may have been, the application of it is hardly more than an advance in the packaging of the inoculants. Each of the species of root-nodule bacteria contained in the package infects the same group of leguminous plants which it always infected. No species acquires a different use. The combination of species produces no new bacteria, no change in the six species of bacteria, and no enlargement of the range of their utility. Each species has the same effect it always had. The bacteria perform in their natural way. Their use in combination does not improve in any way their natural functioning. They serve the ends nature originally provided and act quite independently of any effort of the patentee. Funk Brothers Seed Co. v. Kalo Inoculant Co., 333 U.S. 127, 131 (1948). As such, Funk Brothers indicates that a combination of naturally occurring products should attain something more than its individual counterparts can attain to be considered patent eligible, e.g., the combination of claimed components achieves an enlarged utility or a functional difference that is “markedly different.” This is in-line with the later holding in Chakrabarty, which indicated that both a structural (a bacteria plus four internal plasmids) and functional (a new ability to degrade oil) difference was present in the claimed invention. See figure below. When combined with the holding in Myriad that a structural difference (i.e., cDNA) alone is enough to render a claimed invention “markedly different” one arrives at the “markedly different” test implemented by the USPTO for products of nature: a structural or functional difference from a corresponding naturally occurring counterpart can be sufficient to render a claimed invention patent-eligible. Recently, the Federal Circuit has found eligibility in a number of cases including most notably DDR, Enfish, McRO, Rapid Litigation Management and Bascom. Certain parallels to the “markedly different” test can be found in each of these cases; however Bascom reveals some of the more striking similarities to Funk Brothers and Chakrabarty in the reasoning it offers in finding patent eligibility, in particular the Federal Circuit’s holding that the Bascom claims were patent eligible via the improvements achieved by the particular arrangement of generic and conventional components in the claims. Bascom Global Internet Services Inc. v. AT&T Mobility LLC (Fed. Cir. June 27, 2016). The claimed invention of the Bascom patent (U.S. Pat. No. 5,987,606) includes an internet service provider server that receives a request to access a website, associates the request with a particular user, and identifies the requested website. A filtering tool then applies a filtering mechanism associated with the particular user to the requested website to determine whether the user associated with that request is allowed access to the website. The Bascom patent’s text describes its filtering system as a novel advance over prior art computer filters in that no one (at the time of patent filing) had previously provided customized filters at a remote server. a remote ISP server coupled to said client computer and said Internet computer network, said ISP server associating each said network account to at least one filtering scheme and at least one set of filtering elements, said ISP server further receiving said network access requests from said client computer and executing said associated filtering scheme utilizing said associated set of logical filtering elements. U.S. Pat. No. 5,987,606 at claim 1. In Step 1 of the eligibility analysis, the Federal Circuit found that the claims at issue were directed to filtering content, which they determined to be an “abstract idea,” on the basis that at that level of generality, they felt filtering content was a long-standing, well-known method of organizing human behavior, similar to concepts previously found to be abstract. In Step 2 of the eligibility analysis, the Federal Circuit agreed with the district court that the limitations of the claims, taken individually, recite generic computer, network, and internet components, none of which is inventive by itself. However, the Federal Circuit stated that the inventive concept inquiry requires more than recognizing that each claim element, by itself, was known in the art. Instead, an inventive concept can be found in the non-conventional and non-generic arrangement of known, conventional pieces. The Federal Circuit found that the inventive concept is the installation of a filtering tool at a specific location, remote from the end users, with customizable filtering features specific to each end user. This design gives the filtering tool both the benefits of a filter on a local computer and the benefits of a filter on the ISP server. As a result, the Federal Circuit focused on the “technical aspects” of the claimed invention in finding the claimed invention patent-eligible and stated that while filtering content on the internet was already a known concept, the patent describes how its particular arrangement of elements resulted in a technical improvement over prior art ways of filtering such content (e.g., prior art filters were either susceptible to hacking and dependent on local hardware and software, or confined to an inflexible one size-fits-all scheme). Layering the analytic framework of the functional portion of the “markedly different” test derived from Funk Brothers and Chakrabarty onto Bascom, one can see certain similarities and consistencies with Funk Brothers and Chakrabarty (see figures below). Each of Bascom, Funk Brothers and Chakrabarty can be founded on the finding of a functional improvement (or lack thereof) relative to the state of art. In each of these three cases the claims at issue were directed to a combination of previously existing parts. If the combination achieved a functional improvement that was supported by evidence, the claims at issue were found patent eligible. If the combination failed to achieve a functional improvement or evidence was lacking to prove such a difference, the claims at issue were found patent ineligible. In Funk Brothers, the claims recited a combination of previously existing bacteria. However, the claimed combination lacked a functional improvement because the novel combination of bacteria failed to achieve a functional improvement relative to each single strain of bacteria. This resulted in a finding of patent ineligibility by the Supreme Court. 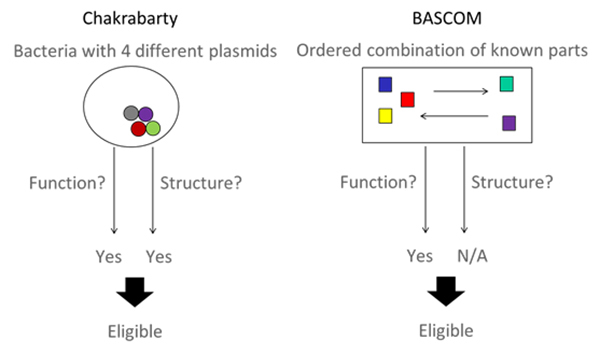 In Chakrabarty, the claims recited a combination of four previously existing plasmids within a previously existing bacterium. In contrast to Funk Brothers, however, the claimed engineered bacterium achieved a functional improvement over its non-engineered counterpart in that the engineered version of the bacterium was capable of degrading crude oil. This, in combination with the structural differences resulting from the engineering, was sufficient for the Supreme Court to find eligibility. Finally, the claims of Bascom recited a combination of known components including a server, a computer, and a filter. On the facts of Bascom, a functional improvement was achieved by the non-conventional and non-generic arrangement of the claimed components in a filtering scheme which allowed the advantage of the ability of at least some ISPs to identify individual accounts that communicate with the ISP server, and to associate a request for internet content with a specific individual account. This advantage represented an improvement (i.e., functional difference) relative to the state of the art, i.e., filters which were susceptible to hacking and dependent on local hardware and software, or confined to an inflexible one size-fits-all scheme. This was sufficient for the Federal Circuit to find eligibility even though the claims only included generic and conventional components. Thus, the combination-based claims in each of Bascom and Chakrabarty were found eligible based on the finding of a functional improvement relative to the state of art, while the combination-based claims of Funk Brothers were found ineligible in the absence of such a functional improvement. If the combination achieved a functional improvement that was supported by evidence, the combination-based claims were found patent eligible. If the combination failed to achieve a functional improvement, the combination-based claims were found patent ineligible. Stepping back, it remains unclear why one exception should be treated differently by the USPTO than the others when assessing patent eligibility. Instead, it would make the patent prosecution process and patent litigation more predictable if a uniform approach were available for all of the patent eligibility exceptions (abstract ideas, laws of nature and naturally occurring products). 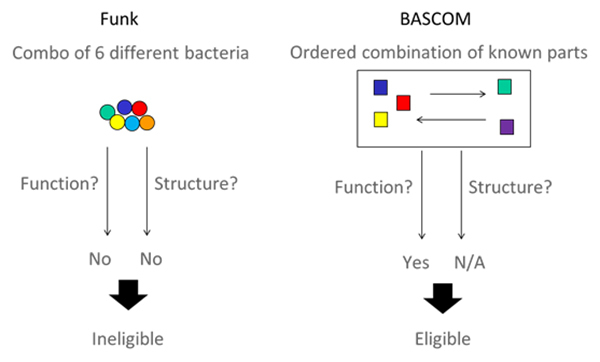 The similarities of the tests and analytic reasoning provided by Bascom, Chakrabarty and Funk Brothers offer the potential for a more consistent approach to eligibility determinations in the inquiry about whether software and composition claims are patent eligible within the context of the current §101 eligibility framework. Originally published by Law360 on July 17, 2017.